LATEST: An emotional Wayne Newton spoke only to 13 Action News after two break-ins at his home near Russell and Sandhill roads. 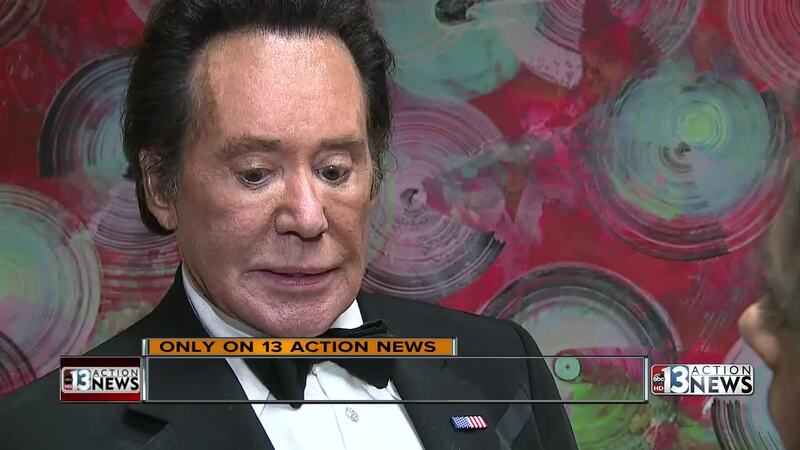 "It was a terrible thing for my wife and daughter to go through," said Wayne Newton. 13 Action News spoke with Mr. Newton after his show at Bally's Las Vegas hotel-casino Monday night. Mr. Newton says the first incident happened on June 3. The second incident happened just ten days later as the iconic entertainer was returning home with his wife and teenage daughter. "She said daddy, there's somebody in your dressing room," said Newton, "so, I ran in to confront them." Newton says the men were able to get away before police arrived. He says he believes the suspects targeted his home. "I'm angry as one could imagine," he said, "I have no doubt they will be caught because we have pictures." The family has since bolstered their security system and hired armed guards. Newton says it's hard to comprehend the impact of a crime like this until you experience it. He expressed gratitude to police for their quick response. Newton also thanked the community for the support. If you have any information on this crime, call Crime Stoppers at 702-385-5555. UPDATE JUNE 25: Las Vegas police released photos of two people involved in the burglary at Wayne Newton's home on June 13. As one of the adults entered the home, two intruders came running out of the house. They managed to get away by jumping over a perimeter wall and were gone before officers arrived. Detectives were also aware of an earlier burglary at the same residence that occurred on June 3. Through the course of the investigation, detectives obtained photos of two intruders in an attempted burglary to another home in the area. In these photos, one of the intruder’s faces can be seen, and the clothing is similar to the clothing in the June 13 burglary. 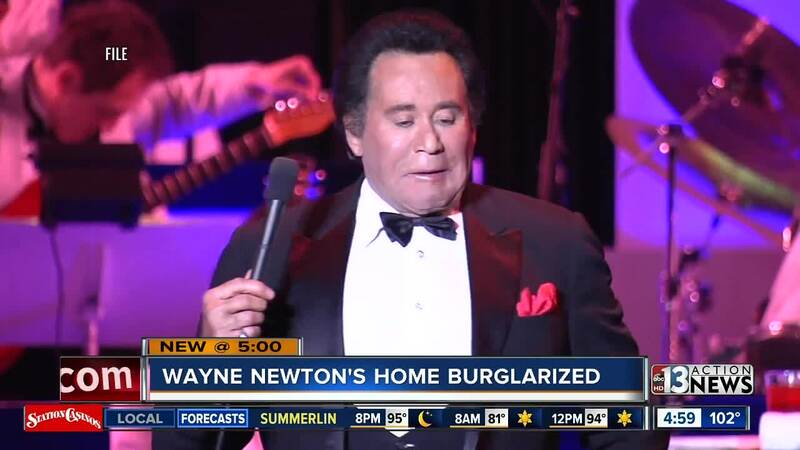 UPDATE JUNE 15: The Las Vegas Review-Journal 's John Katsilometes and Max Michor are reporting that Wayne Newton has upgraded his home security after June 13's burglary. "Wayne Newton is bolstering his home security system and adding armed guards after a pair of burglars broke into his Las Vegas estate late Wednesday night," they wrote. Officers are still searching for the two suspects involved in the burglary. 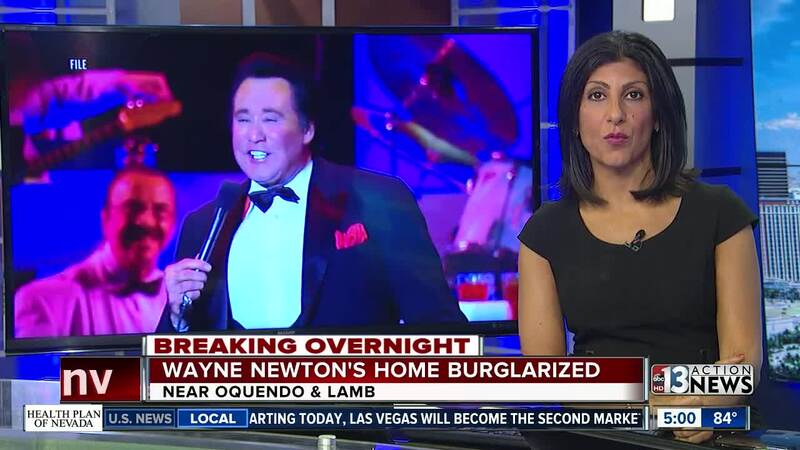 ORIGINAL STORY: Las Vegas police say that singer Wayne Newton's home was burglarized shortly before midnight Wednesday. 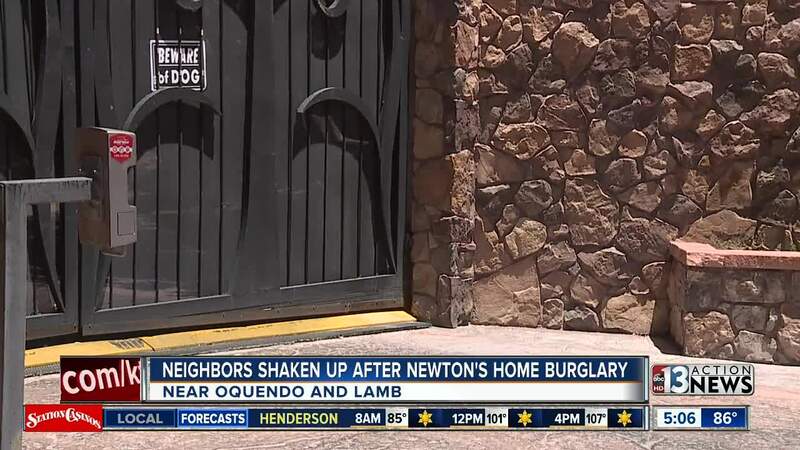 Newton and his wife Kathleen surprised two younger males inside their home near Oquendo Road near Russell and Sandhill roads. The men exited the home and were last seen running north across the property. It appears the men were able to enter the home through a window. Police were not able to locate the men. It is not known if the men were able to escape with any property belonging to the Newtons. Newton has performed in Las Vegas since the late '60s. He is fondly known as "Mr. Las Vegas." The home near Qquendo and Lamb Boulevard is not the same as his more well-known residence, Casa de Shenandoah.